There have been a ton of Super Bowl parties over the past week but none was more super than the bash at venture capitalist and philanthropist Jillian Manus’s Atherton estate last night. Guests — a mix of celebrities, athletes, and a who’s who of Silicon Valley — paid $3,000 each to attend. They probably knew they were in for something special when they were greeted by two kissing seals, which Chronicle reporter Carolyne Zinko explains were a re-creation of the Richmond District’s Seal Rocks in her coverage of the event. One attendee said that Manus likes to have an outrageous sight in front of her house at her parties. The seals, in a 10,000 square-foot tank, were provided by California State University Monterey Bay in conjunction with Moss Landing Marine Laboratories as part of an outreach to raise money for the adoption and care of two baby sea lions that are victims of El Niño and need special care. 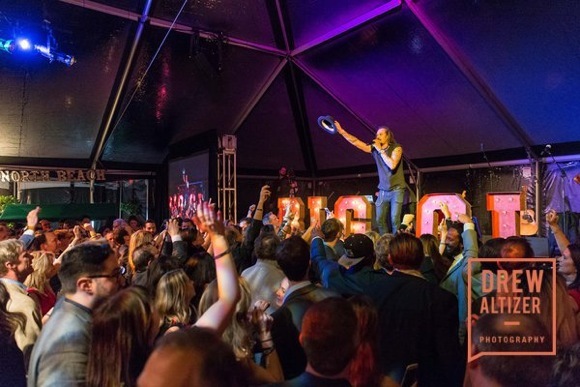 The party was co-hosted by former 49er quarterback Joe Montana and former Giants third baseman Matt Williams; Jay Leno served as MC and Michael Franti proved the entertainment. The goal was to raise $1 million, benefiting the Stanford Cancer Institute, the Four Rings Montana Family Foundation and the Giving Back Fund.